This review includes fanarts done by me. ^_^How I write reviews for awesome books.Step 1: Read a book (Duh! )Step 2: Finish the book and celebrate my achievement with imaginary fans!Step 3: "Write" a review.Step 4: Post fanart and random comics instead.I don't know why I'm addicted to middle-grade children horror books... Crowfield Abbey is not your typical kids series such as Harry Poter or Percy Jackson. We don't get a school for witches and wizards in the Scottish highlands or a hidden camp for demi-gods in the States. No, you'll be surprised because Crowfield abbey is a rather dark book, yet, the magic and the otherworldly are always present throughout the story.StoryLife is peaceful once again in the Crowfield Abbey. Or at least as peaceful as it can be. Will is still helping the monks with everyday chores, while finding the time to practice playing the flute and dreaming of becoming a traveling musician. Hélas, the boring and mundane existence does not continue for long.The abbey is falling apart and money aren't enough to even get some proper food for winter, let alone spend on reparations. Something lurks between the abbey's stones, causing rumors of demons and curses. When all suspicions fall on William, it's up to the boy to deal with the intruder before he alienates everyone or someone get hurt.How do you defeat an evil that even the Unseelie King of the Fae is afraid of. How do you protect people from their own greed and stubbornness. Thankfully, Will's friends are there to help: Shadlok - the Fae Warrior who has been cursed to serve a human master until his deathBrother Snail - the kind monk who has never doubted Will before.Brother Walter - a monkey-like fae, aka habbgoblin, and Will's constant companion. ***What I like***SO MUCH! The Atmosphere was creepy and intense! You see a moving shadow on the walls of a room where everyone is standing still, the noise of flapping wings, unnatural destruction and it's not just the demons and the fae that are scary as hell. Mix between history, fairy lore and christian mythology! Need I say more?Character Where do I begin? Will, our main hero, is kind, compassionate and full of dreams, but he's also envious, greedy and selfish like any normal kid. He's not a glorified version of innocence and good, instead, he's just a human. He has his own fears and doubts, and he makes stupid mistakes, but that's what makes him relatable. Shadlok - the Seelie Fae warrior. He's the cool mysterious silent type that prefers not to get involved. Yet, because of his curse, he is bound to be a servant for the rest of his life. I was intrigued by him in the first book, but in the second one ... I was left with my jaw hanging open. Shadlok is such an emotionless and cold character most of the time, so when we DO see him express his feelings it's always in a very extreme way. For instance, when Will complains about the Cook, Shadlok offers to turn the nasty man into a frog. Will thinks he's joking, but the fey just stares at him intensely and says - I can do it, you know. Just say the word. Whaaaaa? Jeeeeeezasss, that's freaking creepy! LOVE IT! And it leaves me dumbfounded! We know that there is deep hatred nestled in his soul and you don't want him as an enemy, but you can never guess it 75% of the time. It's a character that surprises you and leaves you wondering about his true intentions. The Hobb- He's the cute fluffy character that reminds me that the world in this book is not as threatening and dangerous as it always seem.The Unseelie King - I love every scene with him! I can't say anything without spoiling the book. And many others. ***What I didn't like***...Oh! I'm supposed to say something? Well, ok, let me think. Hmmmm...My only complain would be that the majority of the grown ups are rather 1-dimensional. Especially the monks, who come across as greedy, nasty or narrow-minded, without leaving any space for surprises. If I'm recommending this book to anyone, I would warn them not to expect a cheery and adorable children's tale. The first half of the first book is slightly difficult to get into, the world is darker, the pace is rather slow and the horror... ConclusionI loved the Crowfield Curse, I ADORE the Crowfield Demon, and I can hardly wait to get my hands on the third installment ... well, I'll wait of course, but it will be so painful X( Crowfield Demon:First read: February 8 - 13, 2014Last Reread: January 5 - 10, 2016Rating: Still awesome! (4.5 stars) In The Crowfield Curse, young William and his friends and allies righted a long-ago wrong at Crowfield Abbey and faced down the terrifying Unseelie King. But now another evil is rising at the abbey — one that has even the Unseelie King running scared.The Crowfield Demon is even better and spookier than The Crowfield Curse. I didn’t realize how familiar the abbey had begun to feel after one relatively short book; when the structure begins to fail, it’s like a shattering of the world, albeit a small, circumscribed world. Pat Walsh builds the suspense well. Creepy, inexplicable art in the church; mysterious artifacts found beneath the stones; foul odors; unsettling dreams; hidden documents from the past — all of these add up to a great mystery. William, Shadlok, Brother Snail, and Brother Walter must piece together what’s going on and how to stop it, before things get even worse at Crowfield.William continues to shine as a protagonist. How much do I love this kid? He’s so brave, and so good at heart. He’s been through some terrible things, and most of the monks seem to value him more for his strong shoulders than for his innate worth. One of the best aspects of The Crowfield Demon is William’s dawning realization that, while he has lost his family, he is beginning to build a new one with his dear friends and is no longer alone in the world. It’s so gratifying to see his life get a little warmer.I don’t know how many books are planned in the Crowfield Abbey series, but I hope there will be more. Pat Walsh ties together history and folklore to create a terrific fantasy/horror setting, and brings it to life with well-drawn characters, both the admirable and the venal. I recommend these books to younger and older readers alike. Absolutely fantastic. Having read and enjoyed the Crowfield Curse, I was delighted to discover there was a sequel. I read this book in a day. Darker than the previous novel, the Crowfield Demon returns us to 12th century England, to Crowfield Abbey and William the kitchen boy and Shadlock, the fay bound to his service. When a demon is unwittingly set loose, it is up to William and Shadlock to try and recapture it before it achieves its ultimate goal. The Author blends medieval life in an abbey perfectly with magic and myth to make a truly delightful story that draws you in from the start. There were still questions left to be answered at the end of the novel which leads me to hope a third installment is on the way. I think we can expect great things from this Author. I didn’t enjoy this book as much as I did the first novel in this series. 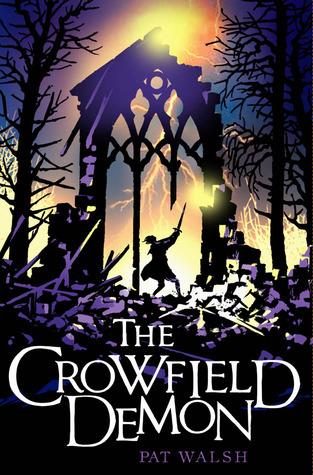 In The Crowfield Curse the medieval theme was much stronger than the supernatural, the opposite is true in this sequel. By rescuing the angel, Will may have broken the curse upon Crowfield Abby but their are darker creatures hidden beneath his home. Under the church lies a demon, and without the presence of the angel to keep it at bay, it’s starting to stir. With the help of noble fae Shadlock, the mischievous hob Brother Walter, and the frail monk Brother Snail , Will and his allies must decide what to do to keep the Abbey safe. But how will they be sure to make the right decisions when the lines between good and evil start to blur?With The Crowfield Demon, the follow up to The Crowfield Curse, Pat Walsh ups the ante by presenting three foes for our young protagonist: the Dark King of the Unseelie Court, the wicked Dame Alice, and finally, the restless demon beneath the church. Although The Crowfield Demon is filled with plenty of satisfyingly spooky moments, I have to admit that I didn’t enjoy it as much as I did The Crowfield Curse. This may be due to the fact that I felt The Crowfield Demon lacked the strong sense of place that I enjoyed so whole heatedly with The Crowfield Curse. It could also due to by discontent with how women were portrayed. It makes sense, given the Abbey setting, that the cast would be primarily male, but I can’t help but feel disappointed that the books sole female character of importance didn’t rise much beyond the wicked witch stereotype. Or perhaps the primary problems lies with me, as I’ve had hard time on concentrating on most books lately (at least one’s that aren’t graphic novels), because I can’t quite put my finger on why I didn’t find this story to be as engaging as the first.At the same time, I have to admit that The Crowfield Demon did have plenty of good moments. I really enjoyed the introduction of The Dark King, and Brother Walter is such a fun character. I also felt there were certain moments that were really nail biting, such as the final confrontation with the demon. So even though I may not have enjoyed The Crowfield Demon as consistently as The Crowfield Curse, the book had enough to it to still be considered likable. I am interested to see how things will continue to develop, given how the story ended. If Pat Walsh decides to write a third book, chances are I will read it. The bad news, this is one of those books that you really must read the first book (The Crowfield Curse) first otherwise this will be a bewildering read. The good news? That’s the only bad news (and book one was really enjoyable, too). William, a young boy left at Crowfield Abbey after his family died in a fire, has some new things to get used to. For one, Shadlock, the fay warrior, is now bound to him for life and the sour fay is slow to settle into monastic life. He is teaching William how to play a flute, the one activity Will actually likes.However, things aren’t going well, even though William, Shadlock and the hob Will calls Brother Walter, saved an angel shot down in the abbey woods a century or more ago. Something is happening to the church. It is beginning to fall in. The first third of the book is them dealing with the possibility that this could happen and what it might mean, as it doesn’t look like a natural event.As stone masons try to save the church, it becomes clear that the cause of the damage is the titular character, a demon imprisoned within the church and there is nothing that is going to stop it from getting free. Worse, it wants William as does Dame Alys, a practioner of the old ways of blood sacrifice. Sir Robert, the local lord, wants something of both William and Shadlock as well. Once the demon is free, what can William, Shadlock, Hob, and Brother Snail (a monk with a severe back deformity and friend to William and the fay) do to stop it before it takes William’s soul?At it’s heart, this is a very simple story in setting and plot. There aren’t a half dozen subplots running around. That doesn’t mean it’s uninteresting in the least. I loved this every much as I did the first book. William, Shadlock, Brother Snail and even Hob are sympathetic and interesting characters. I was very excited at the end to see there will surely be another book. I’m not ready to say goodbye to them. Ms Walsh is an archeologist and her love of history is evident in this. About the only thing this is missing, for those who demand it, is a strong female character. However, given the setting of a medieval monastery, one would be both out of place and not very believable. I’m looking forward to the next one. I liked this story better than the first, so I'm glad I decided to continue after a sort of middling feeling about it.The strength of this story was the characterizations of our heroes - William, the hob, Shadlock and Brother Snail. Most of the other brothers are either insufferable or useless or both, except for poor Peter. (The hob, in particular, is a favorite.) I felt the characterizations were kind of flat in the first book - so it's a definitely improvement there, but the secondary characters are still pretty interchangeable and largely forgettable, and I do think Dame Alys' portrayal actually became more cliche and cartoony.The story also maintains the strong atmospheric tone, which was a strength of the first book.It was a bit slow in places, and I got annoyed at the Prior and most of the brothers being so small minded, and I did think the end battle was, perhaps, a bit too easy - but it was still pretty cool, for all that.I had thought this was a duology, but the story leaves much open for another story - the king is still a problem, after all, and the heroes are warned of a coming darkness. I might have been annoyed before learning there was a third (and final) in the works. When deciding whether to continue after the first book, the fact that there was only one more pushed me into the yes camp.But after reading this one, I'm actually glad there will be another. The Crowfield Demon is a great follow up to the Middle Grade book The Crowfield Curse. I think the publisher's blurb makes the book sound kind of silly. But Walsh does a great job of weaving an accurate historical picture of a 14th English Abbey and fantasy. She adds in historical content so well that you don't really realize it until you reach the glossary in the back. I found the inclusion of angels and demons along side fay and hobgoblins unique. I don't usually see that in fantasy books. But it is a great mesh of the new ways and the old ways. I was really amazed with this book and how the author made it just want to keep me reading the book because of all the suspense that the book created!! I also thought the characters were a lot of fun. Will is a great protagonist. He is kind, loyal, and smart. But, Brother Walter is the best character by far. He is funny and observant. I also really like Shadlok. He is mysterious and proud, but ultimately loyal to Will. The only thing I found strange was that most of the monks are not very nice to Will. Only Brother Snail seems to like Will's company. I'm not sure why that is. I really liked this and was well written. In the future I would like to read more books from Pat Walsh! Dies ist bereits der zweite Teil um das Kloster Crowfield ( Erster Teil: Der Fluchvon Crowfield ) Williams Kloster scheint unter keinem guten Stern zu stehen, ein Dämon und ein einstürzender Turm bedrohen die kleine Abtei. Das Buch spielt im Jahr 1348, hat eine düstere Atmosphäre und ist spannend geschrieben. Mir sind die Charaktere ein wenig ans Herz gewachsen, allen voran der Kobold Bruder Walter aber auch Bruder Schnecke, der Elf Chadwell und William. Das Klosterleben voller Entbehrungen und Arbeit wird gut beschrieben. Das Glossar erklärt Begriffe aus dieser Zeit und der abgedruckte Tagesablauf des Klosters gibt eine gute Übersicht über den Alltag der Mönche. Dank eines Lageplans des Klosters, kann man immer nachschauen, wo sich William gerade befindet. Mir hat diese Geschichte sehr gut gefallen und ich hoffe sehr, dass irgendwann auch der dritte Teil erscheint. In the chilling sequel to the Crowfield Curse Will finds the Abby is crumbling, as something is pushing it from the bottom. Will teams up with the Fay Shadlok and the hobgoblin Brother Walter as he learned he has the Sight, to fight the evil that has possessed the Abby. As Will journeys to find the reason of the Abby's destruction, he finds there is more to it than an unstable foundation. He uncovers the real reason of the destruction of the Abby, a demon. A creature unearthed from long ago with an agenda that involves releasing evil and destruction all over the Earth. Can Will stop it by himself or does he need some friends to fight with him. I really enjoyed this thrilling sequel to the Crowfield Curse and I would recommend it to anyone who is in grade 6 to young adults. This is another book I read while I was supposed to be having a punishment. I'm not sure if it was that, or the fact that I accidentally stole it from my neighbour that made it feel like it was really forbidden at the time. It does make a story more enjoyable, that way. Good read, keeps me turning the pages. I'm intrigued by the dynamic between fay world, and the 'real' world. This one involves a demon haunting the church, and the inevitable showdown between good and evil. The hob continues to be my favorite character, but Shardake is growing on me. Still a little gory. Brother Walter, the hob, and William are back in this sequel to The Crowfield Curse. This time, the chapel at the abbey is slowly crumbling, and Sir Robert's workers are not able to do much to save it. Will knows that this is because there is a demon residing in the chapel. When he is assigned to remove tiles from the chapel to be used elsewhere, he unearths a wooden bowl accompanied by Latin text that indicates it is evil. The other brothers think that perhaps the bowl is the Grail, and insist that it be kept on display. Shadlock, the fay warrior who was bound to Jacobus Bones and is now bound to Will, knows that horrible things are going on but doesn't know quite how to set things right. The brothers decide that the best thing to do is to stay up praying in the chapel all night-- oddly enough, this ends in one death and even more destruction. When the abbot is told about the existence of a demon, he agrees to use Sir Robert again, this time in his capacity as an alchemist, in hopes of binding the demon. Unfortunately, this goes horribly wrong as well. Dame Alys appears throughout the book, and she knows that the bowl was used for blood sacrifices for an ancient religion practiced by her ancestors. She calls the demon Belinus and hopes to free him; Will and Shadlock know the demon is really Raum, and desperately wants Will, because of his innocence. Can the abbey hope for help from an angel in order to defeat this demon? And after all the destruction at the abbey, can they ever rebuild? I think there is probably at least one book still to be written in this series. Strengths: This, like the first book in the series, was just a lovely read. I'm not a huge fantasy fan, but this struck a nice balance between the historical elements and the magical ones that I really enjoyed. Will is a sympathetic character, Walter adds some good comic relief, and Shadlock is mysterious. Weaknesses: The cover isn't wuite as pretty as the first! Not every student will pick this up, but the readers who like medieval fantasies will love it. Now, just like the first book, Miss Walsh did an amazing job of building up the tensions and setting up the atmosphere. The whole setting was so surreal and yet still felt very familiar; the whole ordinary life in Crowfield intertwined with the surreal existence of the faes, elves, hobs, angels and demons. She managed to make their co-existence felt so normal. And I just love how she described everything in simple but detailed ways. I can picture perfectly what the abbey would have looked like with the changes of the season, the monks with their tasks and their demeanor, the forest with all its normal and supernatural atmosphere- everything was so vivid on my mind. And it was such a pleasant kind of vivid. I felt like I was in Crowfield. I love Crowfield. It might sound like a boring place, but I would have loved the quietness, and would have revel at the history and myths surrounding Crowfield (yes, I'm weird in a way).Another thing that made me love Miss Walsh's writing so much is how she put consideration into the tension building. This was a book which involved a young boy, hobs, witches, fae warriors, evil fae kings and angels. This sounded like something epic was going to happen, but in truth there was this darkness in this story; that ambiguous fear and terror hiding itself away behind all these supposedly innocent imagery of fantasy characters. My skin crawled as the demon was slowly unraveled, and I enjoyed the thoughtful exposure of the demon that the author gave to it. The characters interaction felt nice, I root for William through and through, and enjoyed his thought and his conversations with Brother Snail, Brother Walter and Shadlok. And Shadlok was suprisingly funny, in a cold kind of way. And don't worry, something epic did happen at the end.So, go out there and buy this book! If you haven't read the first, go buy and read it as well. The Crowfield books are a gem in my collection, and I will be eager for a third round. One of the best books i've read in a long time, I was totally hooked. I loved the first book in the series, The Crowfield Curse, and had to get my hands on this one too!things in this book get even creepier and unnerving than they were in Curse, there is something that is threatening to destroy the monks home, and everything they do to stop it seems to make things worse. The demon behind all of this quickly makes itself known to Will, and it is one scary demon. It's apperance may not have been that scary, but the way it follows him around and appears out of no where really creeped me out. this whole book had a wonderfully spooky atmosphere to it, and kept me hooked til the end.from the end of this book, it suggests there will be more books so come, and certainly hope there are, because this series is just amazing!highly recommended. best to read the crowfield curse before reading Demon, but i can't imagine you would be disappointed! When I finished the first book in the series Crowfield Curse, I was conflicted. I felt the book had a good idea, but there was way to much focus on what the monks did day-to-day. I really felt that if the author had focused more on the demons/Faes the book would have been on the top of my list of books to read. Well here comes Crowfield Demon and it appears as if my wishes have been granted. Walsh appears to stray from giving me graphic details about prayers, chants, and chores, and actually focuses on the characters and demons. This book is a little "darker" than the first one, and while you could probably read it without having read the first book, you'd be pretty confused. However, the author gives enough clues and hints to ensure readers remember or know what is going on. There were some obviously improvements besides the change of focus. I noticed the plot moved smoothly, and I didn't feel as if I had to drag myself to continue to read parts of the book. The first book, was good, but some parts literally dragged and dragged and dragged to the point of boredom. I honestly cannot wait to read more from this series, and definately recommend it as the mixture of Angels/Demons/Fae is fairly unique and done on a level that both children and adults can appriciate. Having really enjoyed the first Crowfield book last year, I was eager to catch up with William and the rest of the inhabitants of Crowfield Abbey including Brother Walter, the endearing hob and the enigmatic fay Shadlock.It is now March 1348 and a year has passed since the shenanigans involving the fallen angel in the woods and the subsequent battle between good and evil. Surely, peace will now reign in this cloistered domain but alas, there is no rest for the wicked given the evil aura which seems to be settling over the church at Crowfield, tainting the inhabitants' thoughts be they awake or asleep.William, Brother Walter, Shadlock and Brother Snail join forces to track down the source of this malevolence and hopefully conquer it. However they cannot do this without drawing on pagan powers such as alchemy - where will it all end? As usual, the rest of the monks look down on William and don't take his warnings seriously - yes, they will regret it!Pat Walsh has succeeded in keeping up the pace of her first Crowfield novel, cranking up the tension and increasing the mystery of William's family, leaving the reader chomping at the bit for the next instalment in this exciting medieval fantasy. Highly recommended for ages 9-12 and "big kids" too! The magical continues to invade William's world as old and new threats arise. This time the danger becomes more pronounced, being upgraded from the mere threat that it was throughout most of book one.By far the most interesting character is the reserved Shadlok. Cast out from his own kind, he finds life among humans difficult, and is slow to trust William, whom he is now bound to. William himself becomes more entangled by the plots of evil, but even when frightened, he pushes forward, determined to stop them. He is not your typical hero, he is a thinker, not a fighter; he was raised among monks afterall. Therefore he intuitively comes to accurate conclusions because of his cautious nature and ability to observe. Some of his actions are not the wisest though, which speaks to his naive age, for often he wanders off by himself even when danger is present.The books strongest moments come when William works together with his allies. Bonds are built up slowly between the characters though, particularly between Shadlok and William. Unlike the other characters which make ties within one volume, the author has opted to stretch this one out across several volumes, and in all likelihood it will end up the strongest of the lot. This book is not for the faint of heart. It is scarier than the last. So will and the hob are living together and a Fay named shadlok if you read the last one you will know who he is, are living peacefully at the abbey. One day the hob notices mound elves a type of Fay running from the abbey area. They notice that as weird and the hob says some evil is near. So will heads to the tower and notices the prior there and a giant crack. The prior says it is from rain and the hob senses a great evil in that area. So will is sent to town the next morning to go to sir Roberts manor to get some stone masons along the way he finds a mysterious boy at the town central playing music. He talks to him and he says he I will was back with you. So will then heads to the manor and ask sir Robert to spare some stone masons to help fix the wall and he says yes. Before I finish I have to say that it gets kinda creepy at pRts and has a epic conclusion. Here is a clue for when you read. It's a pigeon feather not a..... Ok now who is the mysterious boy? What is this awakening evil? Find out when you read this book. Creepy in the same way as the Spook's Apprentice series, this sequel to "The Crowfield Curse" finds things looking even worse at Crowfield, an Abbey in Medieval England that is also the home of a young orphan, the brother in charge of healing, a member of the fay world, & a hob. Something very evil indeed appears to be inhabiting the grounds of the Abbey, possibly in the chapel itself, & the whole area is being threatened by its malevolent violence. Unfortunately, most of the locals blame William, the twelve-year-old orphan who solved the mystery of the angel in the last book, or possibly the strange man who is always around him, Shadlock (they might not actually know he's a fay, but they instinctively sense his difference). Can William figure out what this evil presence is & how to send it on its way before something truly awful happens to the Abbey & the brothers who live there? I'm interested to see what William has to face next. These books are a really interesting & evocative combination of history & fantasy. This sequel to “The Crowfield Curse” picks up right where the last book left off. William and his fay servant Shadlock are still living at the Crowfield Abbey when a strange evil begins to make its presence known. When a strange object is found buried beneath the church floor, the Crowfield Demon begins its reign of terror in earnest. Great for readers who enjoy medieval settings, there are some interesting details of daily life in the 14th century. Like the last book there is some violence and quite a bit of bloodshed from random woodland creatures (life in medieval England wasn’t easy). There aren’t many explanations of characters and past plot points. While this book might be able to stand alone, it is recommended that the series is read in order. The Crowfield Demon really amps up the tension as it races towards the conclusion, and leaves the reader ready for the next book in the series. I did not like this one quite as much as I liked THE CROWFIELD CURSE, but, I still find Will to be a great character. Even when you already admire him greatly, he still manages to show unexpected depths. And, of course, I love Brother Snail and Brother Walter. Both are steadfast and ethical beyond any normal expectations. And Shadlok is still interesting and mysterious.I'm just not too fond of demons (always excepting those in THE DEMON'S LEXICON, of course), and am put off by their inclusion in books. When I think of the VAST number of books I've read with demons in them, that is probably a bit hard to believe, but it's still true.That said, this demon was appropriately evil and strong, and I totally believed and agreed with the angel's reactions. Very powerful and moving.Ok, maybe it should be four stars. I just wish there were a few females besides the wrong-headed Dame Alys. This is the second in the Crowfield trilogy by Pat Walsh - a series of books that pitches religious beliefs with beliefs of magic and the fae world. Our hero is Will an orphan who finds himself under the guardianship of the monks of Crowfield Abbey, but his real, true companions are Shadlok - a fay trapped in this world and bound to Will for as long as he lives - and 'the hob'whom we both met in the first book of the series. It's a dark tale, taking place in the woods (don't all fairy tales take place in woods...) and the crumbling abbey, threatened by some dark magic. When the church collapses and monks die it is largely because they haven't listened to Will when he talks of dark magic, as they prefer to have blinded faith in their God who does nothing to help them at their hour of need. The language of the book is immediate and now, but in its tone succeeds in reflecting the darkness and senses of the medieval world. As with the first book, when I reached the end I found myself wishing I could read more. What impresses me about this series (and the author) is that the magic is subtle yet all-encompassing at the same time and the setting is limited (in a geographical sense) but somehow the narrative draws you in and effectively makes you a part of Will's life at the Abbey and its surrounding environs. The attention to historical detail and medieval superstitions does much to further the believability of the story. Character development continues in this book, though Shadlock still keeps his secrets close. I enjoyed seeing the interaction between him and the loveable Hob. I'm excited to continue reading as they embark on what promises to be an exciting journey in the next book. The only thing I'm sad about is having to wait till it is published. As far as I know the next book has not been announced, but it is inevitable and I look forward to it. PatWalsh - I was born in Cobham, Kent, and spent my early years in West Africa and Ireland, until my family eventually settled in Leicestershire. When I was nine years old, I decided I wanted to be an archaeologist, in the mistaken belief that they spent their time digging up dinosaur bones. When I discovered what they actually did, and got over the disappointment of a life without dinosaurs,I never looked back. I went on my first dig at the age of twelve, and spent school holidays happily up to my ears in mud on sites in England and Scotland. I worked for most of my adult life in archaeology, and most recently worked as an archaeological illustrator for a commercial unit in Northamptonshire. I now write full time and use my background in archaeology as a starting point for my books.